NOTE: THIS TRIP IS PRIMARILY FOR THOSE ATHLETES INVOLVED IN SPRING SPORTS THAT PREVENT THEM FROM OTHERWISE PARTICIPATING IN THE SCHEDULED MAY COURSES. Others may participate if there is room available. Be aware that if you are not a spring athlete in the Spring semester 2019, and if there is not room in the trip, you will put to the bottom of the waitlist. Spain and Portugal share the Iberian Peninsula and across a narrow strip of ocean is the Saharan Africa. For centuries, this region of the world has been the meeting place for influential cultures that shaped the modern world, and is where the Muslim and Christian worlds collided. This trip will explore the histories and cultures of this region. Our visit will begin in Spain, and include Barcelona, Madrid and Seville where we will visit the world famous, and architecturally controversial, Sagrada Familia Cathedral, the Gothic Quarter, and Guadi’s Parque Guell (fantastic architecture). We will also take an excursion into the mountains to ride the St. Joan cable car to the heights of Montserrat and the Monestir de Montserrat and see one of Catalonia’s spectacular vistas. In a side trip to Cordoba, we will see evidence of the Moorish influence, and visit the Grand Mosque. From there we go to the Tarifa where we will cross the Strait of Gibraltar to Tangiers, Morocco for a completely different cultural experience. In Morocco we will tour Tangiers, and Marrakech, and then spend three days in the Sahara Desert. Through the Atlas Mountains we then cross the desert sands and visit spectacular gorges and valleys. We end the tour in the fabled Casablanca. Take a 4-hour bike tour of Barcelona, including sites such as the Placa Sant Jaume, Placa del Rei, La Catedral, Palau de la Musica Catalana, La Sagrada Familia and Parc de la Ciutadella. Afterwards, enjoy leisure time in the city. Maybe walk along the Ramblas to enjoy street musicians or hop onto the Tramvia Blau for a tram trip up to the top of Tibidabo. Or maybe shopping along the Passeig de Gracia after spending some time on the beach is more your style. Take a short trip to a wonderful abbey set in a mountainous location of terrific beauty and a ride up on the St. Joan cable car to the heights of Montserrat. Travel by train from Barcelona to Madrid (approximately 2 ½ hours). The group takes a trip to the medieval walled town of Toledo known as a city of three cultures; Christian, Jewish, and Muslim. We will see works of El Greco, Alcazar, and the Windmills of Don Quijote. Perhaps try ziplining. Travel by train from Madrid to Seville (approximately 2 ½ hours). Take a guided tour of La Catedral, La Plaza de Espana, Reales Alcazares, and Plaza de Toros de la Maestranza. 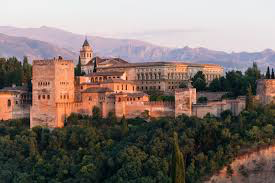 A short jaunt to Granada to visit La Alhambra, Old Moorish Town and the Alcaiceria Spice Market. Stop and spend a short time in Antequera on the way to Granada. Turkish Baths. Return to Seville and enjoy a traditional Flamenco show. Take a bus from Seville to Algeciras, Spain (approximately 2 hours) where we will catch a ferry to cross the Strait of Gibraltar to Tangier (approximately 2 hours), a Moroccan port city that is often referred to as Europe’s gateway to Africa. Upon arrival, we will check-in to the hotel and the rest of the day is free for you to explore the city on your own. Set off on an approximate 3 hour journey to the blue-walled town of Chefchaouen. Upon arrival, we will take a 3-hour city tour which will show you the city and share interesting facts on Chefchaouen's history. Set beneath the raw picks of the Rif, Chefchaouen is rightfully recognized as one of the prettiest towns in Morocco. Known for its blue walls and red-tiled roofs, it steals the hearts of those who visit and somehow keeps the perfect balance between the needs of modern travelers and its own cultural authenticity. During the tour, you walk around the narrow blue-colored streets of famous old Medina. You then leave Medina through its far northwestern gate to find the water source of Ras el-Maa just behind the wall. The crystal-clear water here comes straight from the mountain. Ras el-Maa is a perfect place to relax before you continue your way to Spanish Mosque that was once built but never used. Set on the hill, the famous site offers a spectacular view of the Medina. Settle back in to the bus and travel 3.5 hours to Fes. Fes is the spiritual and cultural heart of Morocco; vibrant, noisy, fascinating and overwhelming – a visual and pungent feast for the senses. It is made up of three distinct ‘cities’, or quarters, and you will stay in elegant, riad-style accommodation on the edge of the huge, well-preserved medieval old city – the mother of all medinas. Today head into the old city, known locally as Fes el Bali, arguably the world's most fascinating and confounding old city. Medieval Fes was one of the world's great centres of education and culture, both Islamic and Jewish. Its religious institutions and libraries are legendary, its mosques of great renown. Walk through the twisting streets and alleyways, passing donkeys piled high with goods, and explore the specialty sections that divide the souk. Filled with historic khans, medresses and dye-pits, stalls loaded with fruits, herbs and soups, and where the squawk of chickens, smell of spice and sound of hammering of copper fills the air, it’s not hard to imagine yourself back in the Middle Ages. Spend the day exploring the old city, visiting, Mederasa attarine, the tanneries and the splendid Funduk Nejjarine, a beautifully restored 18th century inn. Return to your hotel in the late afternoon and enjoy a memorable dinner of one of the city’s signature dishes, the salty and sweet pastille. Today travel to the ruins of Volubilis (approximately 45 minutes). Volubilis was once a provincial Roman capital, a distant outpost of the empire, and the remains make an undeniably impressive sight. Volubilis is the foremost Roman site in Morocco and was declared a World Heritage Site in 1997. Upon arrival you will take a tour around the ruins with a local guide. Please remember to pack drinking water, hat, sunglasses and sun block for this tour as it may get hot and you will be exposed to the sun. And, of course, don’t forget to take your camera as the town is filled with fantastic mosaics along the Decumanus Maximus, many of which remain intact. After time spent imagining Volubilis as the bustling city it once was, continue to Meknes (approximately 2 hours) where you will discover the charming streets of Meknes’ medina – the old walled section of the city. Enter via the northern gate, Bab Berdaine, and walk to the shrine of Moulay Ismail who, in the 17th century, turned Meknes from a provincial town to a spectacular Imperial city. You will explore the elaborately decorated public buildings hidden in these winding streets. Take some time to soak up the bustling atmosphere of the old souk before returning to Fes. Today travel to Merzouga. On route stop in Ouarzazate, where productions such as Lawrence of Arabia, The Sheltering Sky and Black Hawk Down were filmed. Continue to Merzouga. With a backdrop of the orange-colored Erg Chebbi sand dunes, the charming Saharan village of Merzouga feels wonderfully isolated, like the modern world has left it behind. The Erg Chebbi dunes are the most stunning in the country and an essential part of any visit to Morocco. An erg is a vast sea of shifting wind-swept sand that's formed into picturesque, undulating crests and valleys. The Erg Chebbi is one of the world's iconic landscapes, with towering dunes up to 150 meters in height. Located at the end of a sealed road and just 20 kilometers from the Algerian border this really feels like frontier country. You will leave your gear at a simple auberge and then ride camels into the edge of the Sahara Desert, enjoying a spectacular sunset along the way. The dunes are stunning, especially as the evening light plays across them and sets off the colors. Tonight, you will camp out in traditional style, with the chance to try some fantastic local cuisine while you sit around an open fire. Stay late after the dinner, enjoying lively music, drumming, Bedouin stories and dancing under the stars. A three day trip into the High Atlas Mountains and onto the sands of the Sahara features lodging in a small inn on one night as well as a tented encampment on another. Highlights visits will include: Dades Gorge, Tiz nTichka Ait, Benhaddou, Ouarzazate and the Valley of the Rose, Erg Chebbi, Merzouga, Todra Gorge and a chance to trek on a camel. Today enjoy guided tour of Marrakech by bike. This magical Marrakech activity is 2 ½ hour long discovery tour of the mystical and magical city of Marrakech. Travel through the King’s palace, the Medina, and the Djeema-El-Fna, where we will stop to drink some of the best fresh squeezed orange juice in the world. We’ll also enjoy the history of all-natural Moroccan remedies along with smelling Moroccan spices. See the Koutubia and many other historical landmarks that the city has to offer by bike. The name Essaouira means image, which is appropriate since it’s such a picturesque town. Its charm is undeniable; within the stone ramparts you’ll find whitewashed houses with bright blue shutters, art galleries and wood workshops. This laidback artists’ town is a former Portuguese trading colony and was once home to sizeable British and Jewish populations. We will take a walking tour through the old medina, Jewish mellah, port and skala (sea wall). Embark on a city tour taking in the main sights of Casablanca. The evening is at your leisure to explore this majestic city on your own. Explore one of the souks or street markets where you can purchase small trinkets. Be sure to visit the legendary Marche Central on Boulevard Mohammed V for seafood and Moroccan-style souvenirs, as well as some handicrafts.